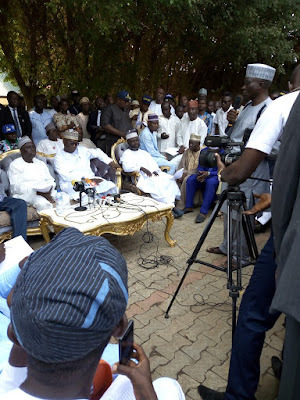 The Kwara State All Progressives Congress (APC) governorship candidate, Alhaji Abdulrahman Abdulrasaq has accused the senate president, Dr Bukola Saraki of masterminding the attacks on APC supporters in Ilorin during the weekend. Abdulrasaq made this disclosure on Monday while addressing journalists at a World Press Conference over frequent attacks on APC members across the state. The APC Candidate condemned the violent attacks on party supporters by PDP armed thugs in Ilorin on Sunday. He said Kwara PDP resulted to violence because the people have rejected them due to bad governance, corruption, non payment of salaries and maladministration. His words: ”AbdulFatah Ahmed is not an executive governor, he can’t take decision without approval of his godfather (Bukola Saraki). Kwarans will not vote a puppet governor again. It’s their leader that is doing the talking at political rallies. ”There is a lot of work to be done and I am ready for the task ahead. Imagine, PDP candidate vowed to pay N30,000 minimum wage when the current administration is yet to implement N18,000 fully. OTOGE! Abdulrasaq however called on security agencies to bring perpetrators of this heinous crime to book and prevent reoccurrence. Earlier, the APC Senatorial Candidate in Kwara Central, Dr Yahaya Oloriegbe accused the Senate president, Bukola Saraki of masterminding the attacks of APC supporters. Oloriegbe noted that Saraki and his cohorts plan to intimidate and scare electorates from exercising their franchise. ”Even as a new entrance into politics in 2003, Saraki used similar methods of intimidation, harassment, maiming and killing when he was to become Governor. We can still recall how Ganiyu Ladiele (Akalambi area), Alhaji Issa Zaria (Otte town) were killed during 2003 elections campaign period. Himself and his team were the first to condole the family of deceased persons. He bought vests, cutlasses and guns with the inscriptions of ”Up Lawal” to create an impression that the then Governor Mohammed Lawal was the one that sponsored the miscreants.” He added. Oloriegbe disclosed that about 50 armed thugs invaded venue of APC rally at Ode Alfa NDA on Sunday claiming one life, wounded 50 and vandalised 30 vehicles. He implored party members and supporters not to be dissuaded by the unfortunate incidents.